front-line team members helps them see how their actions affect customer perceptions. Positive praise from customers can inspire your team to “go the extra mile” in service interactions. 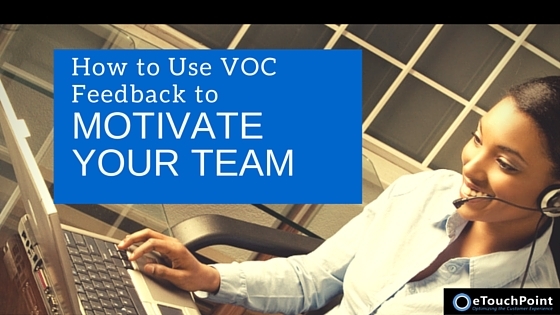 Visit our blog to learn 3 proven ways to motivate your team using VoC feedback. Most organizations pay careful attention to selecting closed-ended questions in CX surveys. However, they often overlook the value of asking for open-ended feedback. Discover 3 reasons open-ended feedback is essential to your CX strategy in a recent article on our blog. Voice of the Customer initiatives can create big benefits for companies. Despite their success, executives are often hesitant to embrace them. Many business leaders still struggle to see the value in investing VoC program improvements. Visit the CMS Wire blog to learn 8 tips for winning leadership buy-in for your VoC program. As technology and customer experience strategies have evolved over time, CX survey practices have naturally followed suit. The way companies capture VoC feedback today is a radical departure from yesterday’s methods. View MyCustomer’s infographic to see how listening to the voice of the customer has changed over the years.